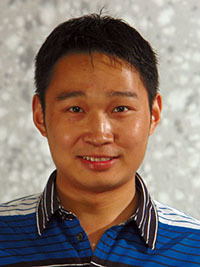 Ph.D. student Dan Zhang has received a 2012-2013 IBM Ph.D. Fellowship. According to the awards website, "The IBM Ph.D. Fellowship Awards Program is an intensely competitive worldwide program, which honors exceptional Ph.D. students who have an interest in solving problems that are important to IBM and fundamental to innovation in many academic disciplines and areas of study." Dan Zhang was also named a finalist for this year's Facebook Fellowship. Dan joined the Computer Science Department at Purdue University in 2008 and has been working with Professor Luo Si in the research areas of information retrieval, data mining, and applied machine learning. Zhang has also been supported by the Center for Science of Information (CSoI), an NSF Science and Technology Center, to work alongside Si and Professor Vernon Rego on research problems of social media analysis.